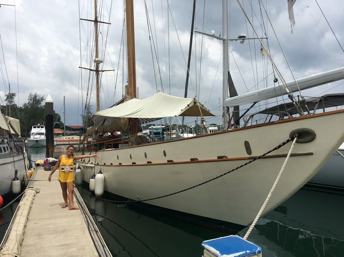 Birregurra has recently returned from a fabulous cruise to the Anambas Islands. This was really quite different from anything Birregurra has done before. The anchorages, sailing, remoteness and in particular the wind, were just fantastic. A total of four on board – John, Jane, Veron and myself. 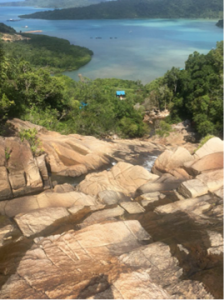 Anambas is at the south western edge of the South China Sea, so it’s quite exposed and isolated, and we needed good preparation, as there are no marinas and almost no assistance. John must have been a young ‘un when he first sailed on Rona? The best preparation is to read and re-read the Howath’s journey, and follow precisely their anchorage waypoints – they are very accurate: https://www.thehowarths.net/cruising-information/cruising-notes/449-the-anambas-islands-2016 Thanks also to Ashley for relaying some of his extensive learnings from his trip last year. The Charts in this area are not so accurate. John downloaded the KAP files from the Howarth’s link, which meant we had google earth images on a pc, which when connected to the yacht’s nav wifi, gave us an accurate position in relation to the coral on approach to anchorages – very, very helpful. We ramped up preparations in the final week. Provisioned mostly via RedMart who delivered to the start of the jetty. Apart from two lunches ashore, we ate all meals aboard, so lots of food and drinks to load up. We carried 500L of water in two tanks (only 300L used), 160L of diesel in the fuel tank and another 125L in plastic jerry cans (also not used). 60M of chain plus another 30M spare in a locker, and most importantly, a bloody good anchor. A life raft, sat phone, personal location beacon, updated B&G Navionics, backed up with an ipad, pc and charts. Plus all the usual safety kit, tools and spares. We were loaded up. We set off from CSC at 9:25am on the Sat 4th Aug, cleared Immigration at Angler, and motored the 15NM to Nongsa into the wind. 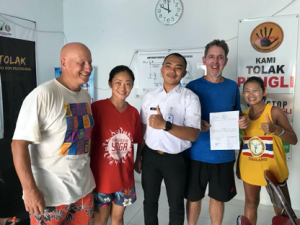 Cleared into Indonesia, caught a taxi to Batu Besar and got local SIMs (actually very limited coverage throughout the Anambas Islands) and had a fabulous local lunch before heading back to the Marina and some last minute preparations. The girls were impressed with the hot showers and free laundry. We decided to stick to plan (despite reports of 4M seas), and after a quick look at Rona (a 1895 sailing yacht John first sailed on), we let go at 11am. The rain came down almost immediately, so we motored for the first 45mins, but then with 2 reefs in the main and a full jib, we cut the engine – not to be restarted until we arrived at our anchorage. As we settled, we shook out one reef, and then stayed on a starboard tack all the way, with 13-19kn of consistent wind on the beam. We rounded Horsburgh lighthouse and stayed to the southern side of the shipping channel. We had minimal traffic, a million stars and excellent wind. John and i did 4hr shifts. Poor Veron was very seasick most of the way, but we all wore life jackets and were tethered on overnight as the seas became quite confused with a very uncomfortable 1-2M swell. John somehow managed to hang on down below and cooked a loaf of bread in the oven, and we arrived to the North East of Jemaja and had our anchor down before 11am. What a ride – 186NM in under 24hrs – this is what Birregurra was designed for. We anchored on 14M in sand, and had some excellent snorkelling. Veron was quickly back to her usual self, and we had one of Meau’s fabulous pre cooked Thai curries for dinner. We motored out between the islands, following the Howarth way points, and at one point, our nav said we were over land! – which thankfully we were not. We sailed the 3.5NM to Teluk Mampro under jib only, and anchored along a 3km beach in 5M on sand. All four of us piled into to the kayak (designed for 2-3), and we paddled ashore. We then walked 2km to Letong town, stopping by the local school for some free wifi..
After watching a cadet parade where the local girls amusedly wore hijabs and pj bottoms, we found a very local restaurant, that sourced a couple of unrefrigerated beers but lots of ice. Day 4 was a bit rainy early, but we had John’s home baked rolls with bacon. We motored to Pulau Impul and anchored. There were unchartered awash rocks nearby which made me a bit nervous. 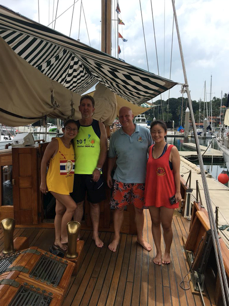 After snorkelling, we had roast chicken for lunch, then pulled up full sails and headed to Telaga, about 14NM. I was just off the helm and down below, and heard something bang on the foredeck. By the time i was on deck, the head sail was fully down and in the water behind the stern, but still tacked on. The top shackle had come undone. We recovered the sail and continued under main only. We anchored at the Howarth’s recommended spot in 18.5M (under the keel) between Pulau Lima and Telaga Kechil. Quite a bit of wind funnelling up the channel, and so with the jib swivel stuck at the top of the forestay, there was no way we could sensibly send someone up the mast to retrieve it. John remembered something he had seen on the internet in one of his more idle moments. And so out came the potato masher (only the old fashioned ones will work), lifted up by the spin halyard, and down hauled with the remaining furling line. We pulled it up and managed to snag the swivel and pull it down. With a new shackle, we raised and furled the jib and sat down for a well earned beer. Although we were bobbing around quite a bit, we enjoyed a secure nights sleep. Next morning after a visit from a fisherman in a dug out canoe, we sailed under jib to Durai – otherwise known as Turtle Island. Attempting to anchor to the north in 20+M, the chain partially wrapped around a coral head, and so the anchor didnt set. It was a bit of a tricky situation, so John snorkelled ahead and with excellent visibility, could see the bottom and we steered our way around and out of trouble and recovered the anchor without drama.We pulled up the sails and headed to the South East of Semut, making 8-9kn of boat speed with 15kn of wind on the beam – what a cracking sail. Semut was a lovely protected anchorage in 12M on sand, and with coral reefs on 3 sides; so very calm and lots of snorkelling. After 9hrs of the best sleep, we snorkelled for two hours. John saw a turtle and i saw a Kuhl’s stingray, about 45cm across and with a barbed tail half as long again. There were 3 small fishing boats rafted up nearby, and they offered the girls fish. We offered beer and milk in return, but of course they were only interested in the fresh milk (susu). John swam across with the milk carton in a bucket, and returned with 3 1kg++ excellent fresh fish. And so it was pan fried bream with a citrus couscous for a fabulous lunch. We reluctantly left this anchorage – could have easily stayed a few days. And with a sunny sky, white caps, wind on the beam, and Veron on the helm, we powered along to Pendjalin Besar, dropping in 17M with all 60M of chain out. A quick snorkel confirmed we had a well set anchor and plenty of swinging room. It was a windy and bit bouncy night, but we enjoyed a dark n stormy (rum and ginger ale), and roasted bream in the oven for dinner. Next morning, we had excellent snorkelling, John saw a cowtail stingray and I had a real surprise when i saw a 6’ black tipped reef shark. The beast took a couple of very deliberate and slow circles around me, and then (thankfully) disappeared. I caught up with John and we saw him again, and as we headed the 400M back to the yacht, he followed us most of the way! I guess curious, or just showing us whose territory it really was. For obvious reasons, we decided to not mention to the girls!. 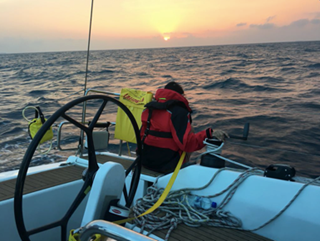 After breakfast, we sailed off, 2 reefs in the main and a slightly reefed jib, close hauled towards Moonrock Lagoon, on a course similar to what we would have on our way back to SG, with waves breaking over the foredeck and occasionally coming over the helm. We followed the Howarth’s way points into the Lagoon, and anchored in front of Moonrock bluff. This must be the signature anchorage in the Anambas. Protected to the North, East and South; just spectacular. Smoked salmon and fresh bread for lunch. 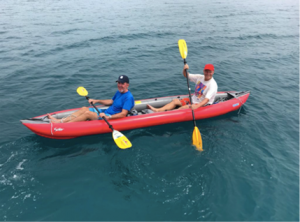 Then John and I paddled to the bluff, and made the 15min quite strenuous climb up. The views were truly spectacular and well worth the effort. I think a couple of cold beers up there next time, watching the sunset would be perfect. Afterwards we all had a snorkel, then back on board for a refreshing GnT (the small freezer in the fridge makes just enough ice). Roast lamb in the oven, and a million stars in the sky – this is the place. After b’fast, a spirited two reef sail on a single tack to Pulau Temuruk, also known as Sandspit island. 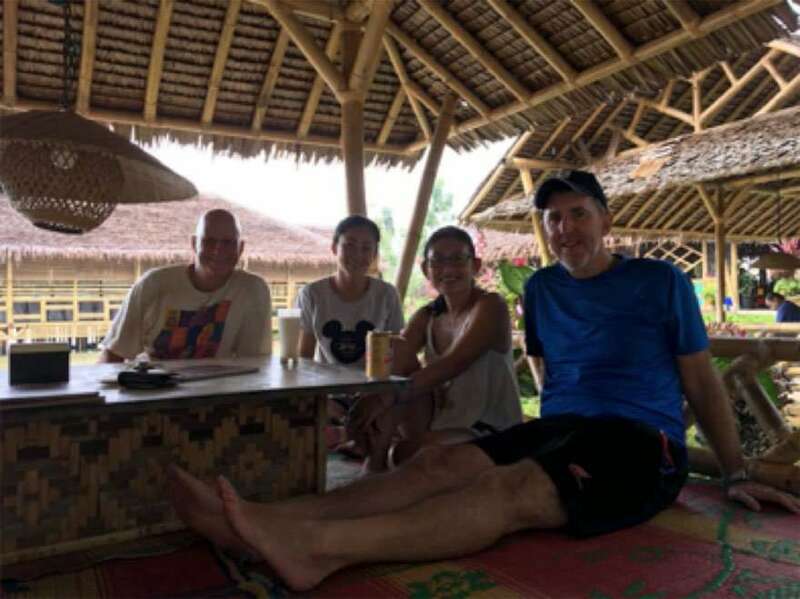 A MOB exercise to recover my hat, then lunch, snorkelling and on to our overnight destination – Pulau Penjaul. We used our final fish tonight for a fish pie. In the morning, we paddled to Pedjaul then to the next island to the west, where a caretaker couple look after an ambitious project which started with a rock jetty, some initial buildings, but then stalled. It may be a fabulous place one day. We sailed out around the bottom of Masabang, then continuously tacked up the channel to Temburan Waterfall. Veron and I paddled to the stilt village, then began up the steep steps. It proceeded to get more and more vertical, and we scrambled the last bit on all fours. We reached the top after 30mins for some great views over the waterfall down to the yacht. We decided to walk down the new road on the way back, and bought a couple of tomatoes and potatoes. Most of the villages obviously run off a diesel generator for only a few hours a day, so no cold drinks here. We motored the short distance to Anambas Bay Resort South, and found a good anchorage in 20M close to the township. I winched John up the mast to tighten the radar reflector which had been spinning like a top, and then it was a GnT on a lovely calm anchorage. Up early on day 10, i guess it was the Mosque music. We had noticed the head sail need some stitching (obviously damaged when it went in the water), so we took it down and John stitched it up. Then it was around the corner and into the main township of Terampa, so we could check out of Pak land. We piled into the kayak with a couple of bags of rubbish, and paddled ashore to the amusement of many. Thanks for the chop, Pak! Next it was Customs, more joking around and many new ways to pronounce Birregurra. More of the same and some skilled work on the typewriter at Quarantine. Our final stop was to find the Harbour Master having Makan and a smoke – some more paperwork and we were finally done. It all took a while but patience and good humour go a long way, and it saved us a trip back to Nongsa, so well worth it. Some Makan, then back on board after 3hrs. Our plan was to sail to Airabu, but with lots of tacking, we wisely decided to anchor north of Akar – you really need daylight coming into anchorages here. We definitely needed Google Earth to get our anchoring right here as the maps were a long way out. Tonight it’s Jane guacamole and tuna pasta bake b4 commencing the long haul back tomorrow. We were up at 6am, and heard the strain on the anchor chain during the night, but all good. Coffee, a BLT wrap, topped up the fuel (didnt need to), and headed out into 19kn of apparent wind, two reefs, a big heel on a port tack. We had planned to drop in to Bawah. It is a fabulous anchorage, but is now a resort and they charge USD200 night to moor up – no anchoring now allowed. Anyway, we planned to just drop in for a look, but it would have cost us 6hrs, so we held course for SG. Close hauled into 2M seas, quite a bit of slamming, but we managed to hold a single tack all the way back. Around 5am, there was a very strong smell of diesel. We checked but found no leaks, and it abated after about 10mins, so we concluded we had sailed through a diesel spill/dump. As the sun came up, we approached Tompok Utara, and crossed at the area where the tankers begin merging prior to them entering the TSS of the Middle Channel. We tracked up the northern edge of the channel, arriving Angler around 3pm. As the wind had finally dropped, we motor sailed the last 4hours. So we had 28hrs of continuous spirited sailing on the way home – what a bonus. We made the final hop to CSC, clocking up 589NM for the trip, and secured Birregurra to her trusty mooring, and had a cold beer aboard. Ferry boat, ferry boat on channel 77, ashore, a hot shower, and we all joined a bbq with my team at CSC – a great way to finish a fabulous cruise. 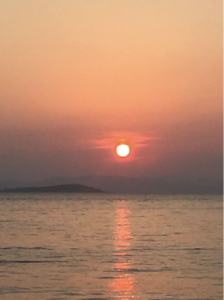 We were perhaps incredibly lucky – no squalls, hardly any rain, fantastically consistent wind, sunshine, deep water, almost no traffic, no fishing nets and great anchorages. Some nice shore visits and a couple of very good hikes and lots of snorkelling made this a well balanced trip. It would be great to get a small flotilla from CSC interested for next year. 3-4 well prepared yachts would give some more safety in numbers. July/August seems to be the time to go. Preparation is the key. We took Choy’s advice and used tank water for drinking, and largely avoided using plastic bottles at all, cutting down our rubbish by 70%. No generator – just a solar panel and running the alternator for a bit most days was enough to get us through. The fridge worked very well, and we had cold beer every night. All in all a great trip, and looking forward to next year! Sailing since 2006, JoinedSimbaaround that time, and now a regular on the Jong Dee crew for the Twilight and Sunday Series at CSC, and the occasional regional regatta on Birregurra (Phang Nha Bay) and looking forward to other crusies in the region.